Includes Universal Handle and Troop Tool. This is the primary, best tool head for temperate forests both Western Conifer, and Eastern Deciduous Forests. TROOP TOOL KIT COMES WITH ONE TOOL HEAD. PICTURE SHOWS 3 BLADE SET OPTIONS THAT CAN BE INSTANTLY SELECTED & LATCHED FOR INCREDIBLY VERSATILE EFFECTIVENESS. 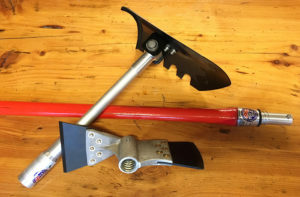 A push button, spring loaded latch mechanism; allows fire fighter to choose best shovel blade set for different fire chores. Top picture, First, blade set option: a fire shovel, for digging and throwing dirt to knock down flare-ups. Cool snags etc. 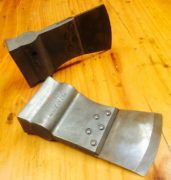 Second, blade set option: is for a stand erect, line scraping tool. 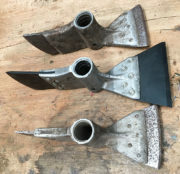 It is a far better McLeod, because the curved blade slices through the ground cover at a better angle. Serves as a better fire rake or council tool in Eastern Deciduous Forests, because of the high-backed leaf collecting ability to pull a swath of leaves to form fire line downhill. This tool is the first stand erect, mop-up device for chinking, mixing, hot material with dirt. Simply turn the tool so the shovel tip hits the ground first, in the, 90 degree, blade set; (the McLeod mode). Takes the drudgery out of the tedious, unending toil on mop-up operations. 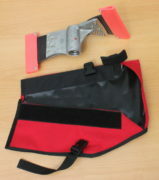 Third blade set position: is a cross-country, safety staff break mode; to eliminate falls in the forest. This is the first, and best idea to assist fire fighters deal with steep, slippery or bad ground. Falls, going to and getting back from fires ranks as the biggest cause of fire fighter injuries. This is the perfect tool for Ops Chiefs, Division Supervisors, and other overhead to always use. 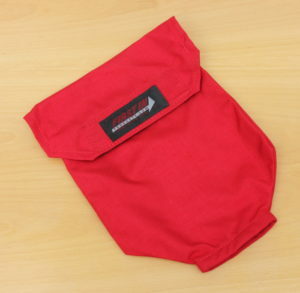 It keeps them armed for emergency fire shelter scraping or simply to help on nasty slop overs, that they come across, while walking the line, after the crew has passed.